City Map of San Francisco, Calif. 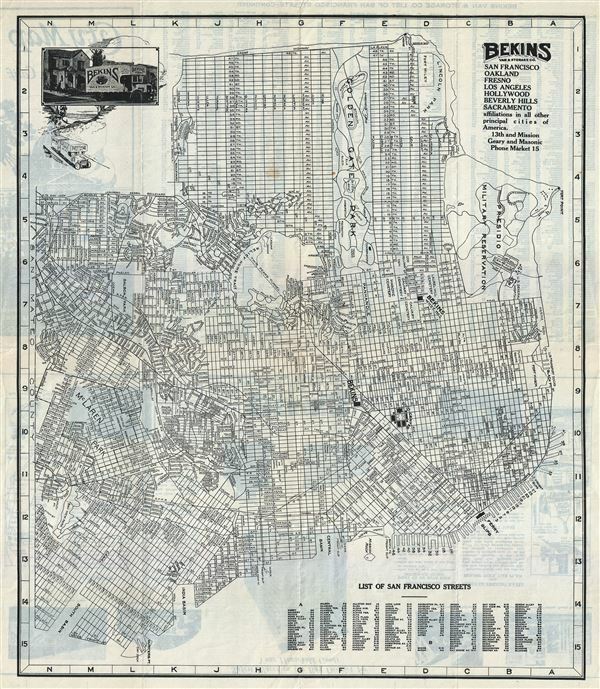 This is a fine c. 1930s pocket map of the city of San Francisco by the Bekins Van and Storage Co. The map shows all major streets, piers, parks and cemeteries. It covers San Francisco from the Bay View Park in the south to Fort Point in the north and from Great Highway in the west to Hunters Point in the east. The population of San Francisco at that time, as mentioned on the cover of the folded map was 650,000, indicating that this map dates back to the 1930s, before the construction of the Golden Gate Bridge in 1937. It notes all major streets, piers, parks, cemeteries, railroads etc. An index on the bottom right corner includes a list of San Francisco Streets. The top left corner contains a photograph and graphic of the Bekins Company. All Bekins storage locations are noted on the map. Verso contains a continuation of the index of the list of San Francisco streets along with advertising text and photographs for the Bekins Company. This map was produced and distributed by the Bekins Van and Storage Co.